The thought of Rajasthan brings a splash of colours in my mind, soulful music by Manganiars and Kalbelia dancers apart from the fiery food. All these powerful images in the background of almost monochrome deserts that can make one terribly sick in a summer noon. 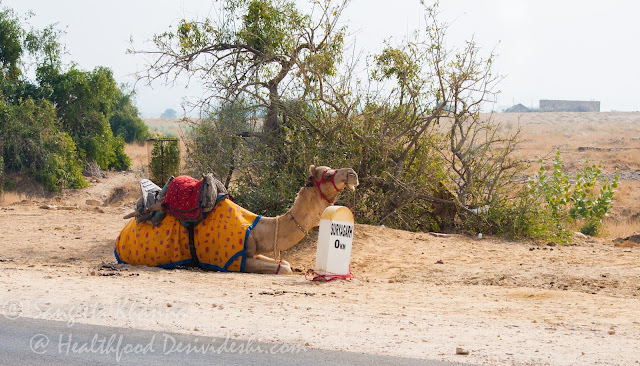 Rajasthan is the land of nature’s extremities and sheer human will to conquer that. 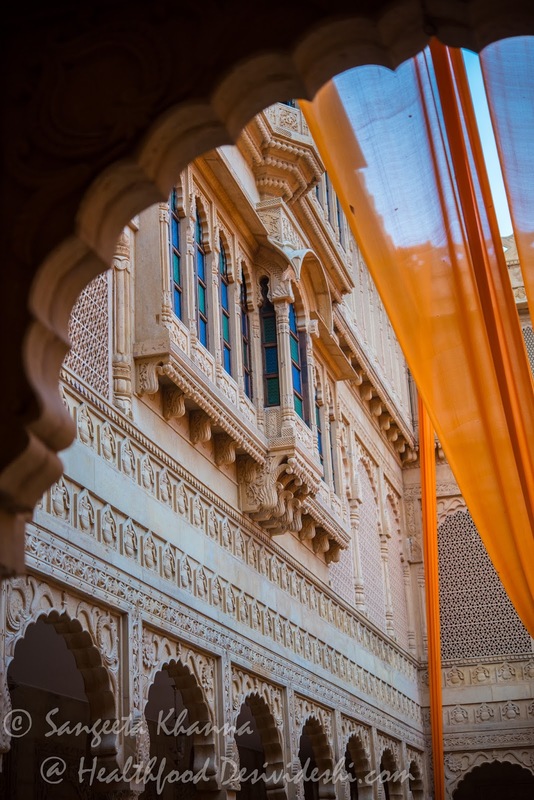 Jaisalmer is the western tip of this desert state and has a glorious past being a part of the silk route that connected this desert to other parts of the world, this desert welcomed many travelers from all over in return. 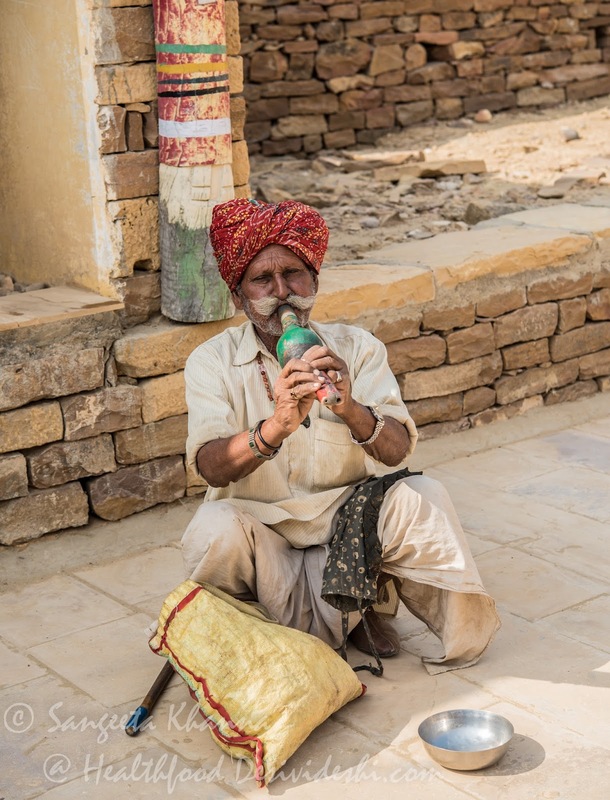 We visited Jaisalmer last month and were smitten by the exotic charm. The landscape looks like another planet but the colourful splashes of the tribal dresses and artisans, glorious buildings and bazaars inside the city leaves one mesmerized. 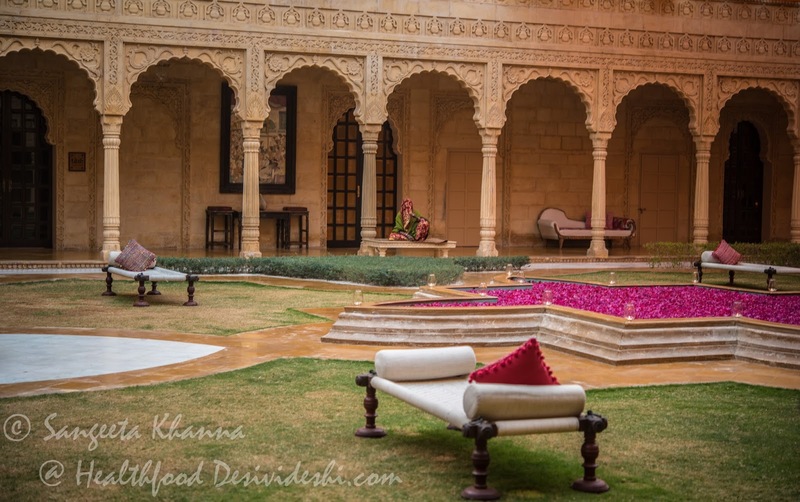 We had the privilege to stay at Suryagarh Jaisalmer, nominated among top 10 luxury hotels of India and it turned out to be one of our best travel experiences. 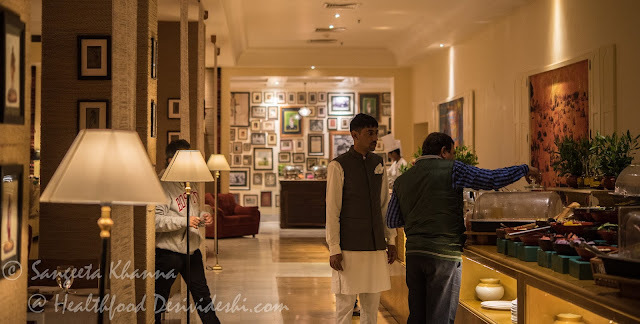 Suryagarh pampers the guests so much that I had started hearing stories about it even before we landed there. 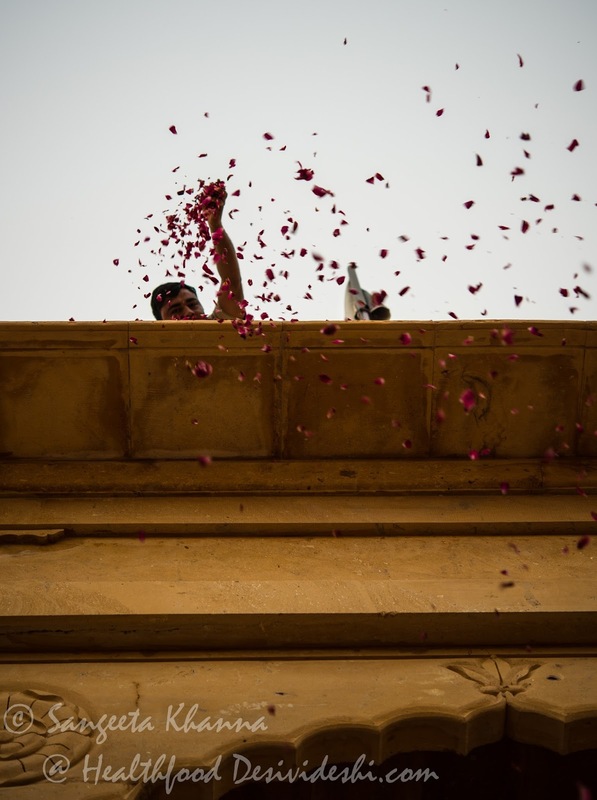 We took a flight to Jodhpur and the hotel had sent a car to receive us. Seeing the driver with my name on placard at the arrival lounge gave me an idea what the hospitality is going to be like. The car had all the wet towels, chilled drinks and jars full of sweets and savories for the 5 hour drive that would take us to Suryagarh. The drive through the desert was quite interesting as we saw hoards of camels and even got to drink freshly milked camel milk thanks to our affable driver Bhanvar Singh. Green Bee Eaters on the roadside wires and Chinkaras on both sides of the roads kept appearing every now and then while the car kept speeding up on the smooth roads. We stopped at a roadside dhaba for lunch and got to taste wonderful local meal of papad methi ki subzi, gatte ki subzi, sev tamatar ki subzi with bajre ki roti and buttermilk. 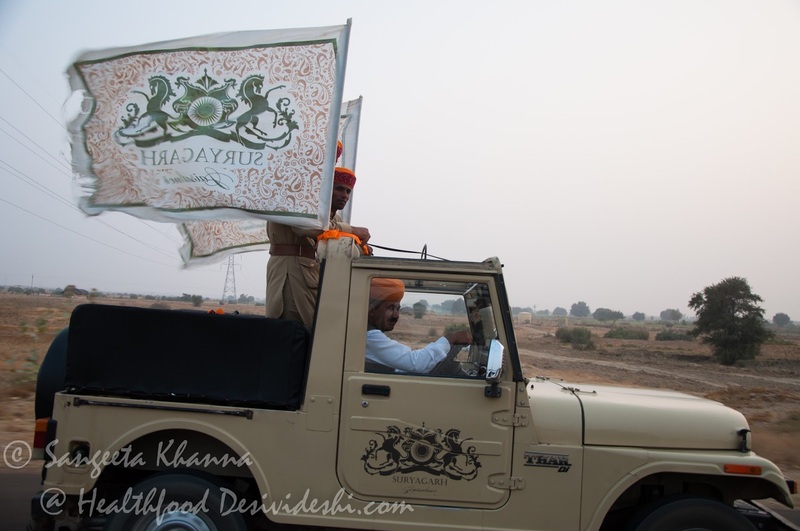 A guard of honour was given to us as soon as we entered the city and a jeep with guards and Suryagarh flags started driving ahead of us. 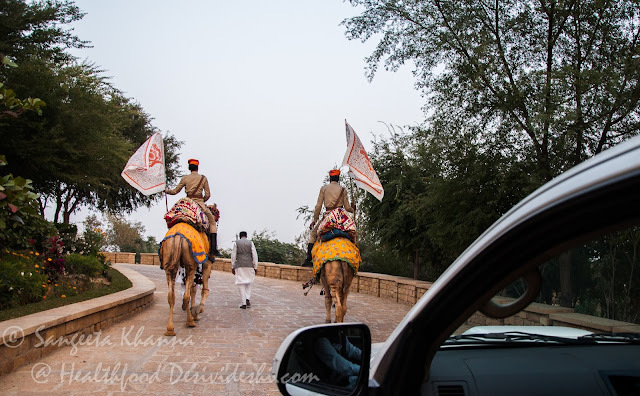 This brought a huge smile on our faces, the smile got brighter as we entered the gates and a pair of camels welcomed us and started walking ahead, leading us to the outer courtyard to drumbeats and Rajasthani welcome songs. Atithi Devo Bhava taken to the next level. 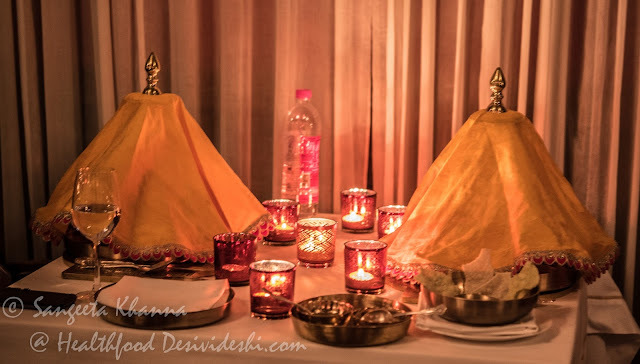 Nakul Hada greeted us with his team, tilak was applied by Pandit ji and a shower of rose petals next, we were led to our rooms that felt like a warm cocoon after a long drive. An invitation for the evening musical programme was waiting for us on the table. 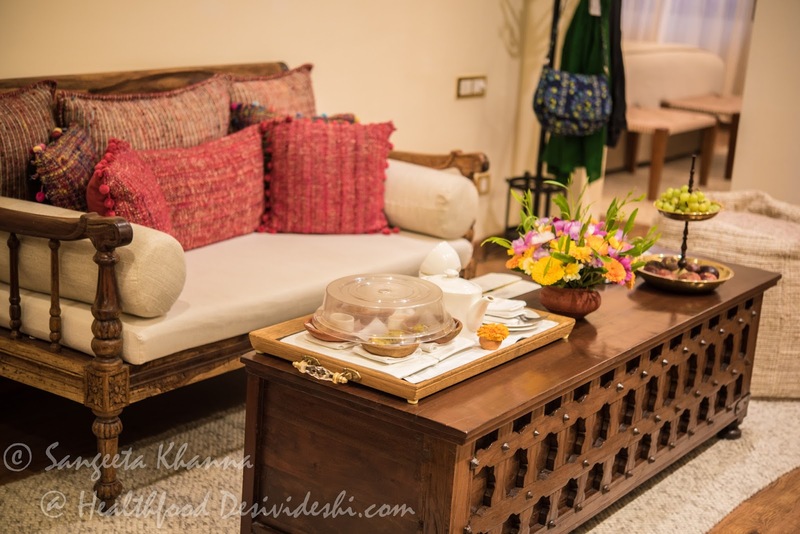 Our room, The Signature Suite was going to be our home for 4 days, it was one cozy comfortable room with fruit laden platters and fresh Mithai being replenished every day. After freshening up and tea and snacks in the room, we went for a tour around the property before going to the plush backyard where they host the musical performance by the local Manganiyars every day. Manganiars are traditional Muslim singers from this region and Suryagarh has employed a whole family with them, so member of the same family keep singing in different locations for different events and all of them are great singers. We spent a very good evening listening to their songs of longing and love, some dance and storytelling. Suryagarh team has laid out charpoys, chairs and comfortable cushions for the guests under decorative canopies where one can enjoy the music. 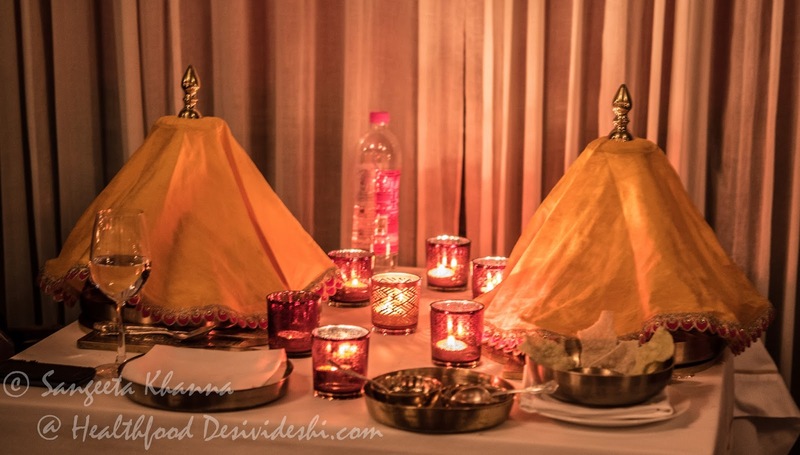 Diyas and lanterns are lit up beautifully to make the atmosphere surreal. 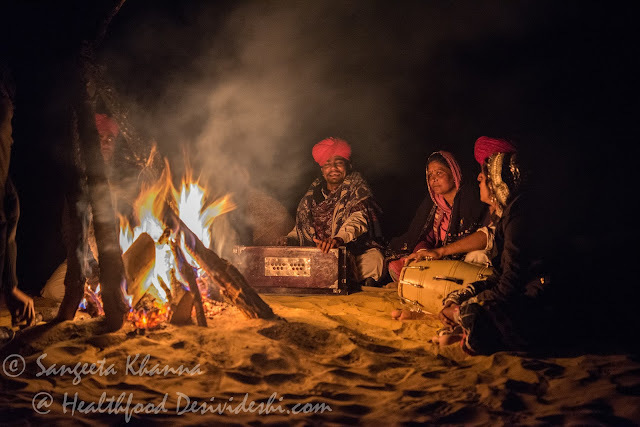 Later we went for the romantic dinner on the sand dunes where the group of Manganiyars were performing by the campfire. 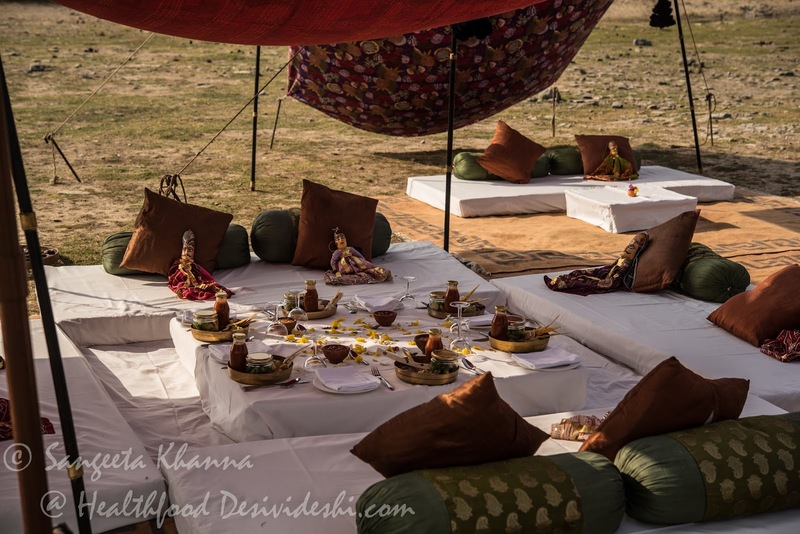 Suryagarh team arranges a luxurious dreamy dinner on the dunes with mattresses laid out on the sand, pillows and quilts for the cold winter evenings and numerous lamps dotted along the sand dunes. A team of chefs keeps bringing game meats and several other types of traditional shikar style food in earthen plates, drinks keep flowing and music gets better and better as the moon rises in the sky. We even spotted a shooting star thanks to Nakul Hada who caught a glimpse first and alerted us. 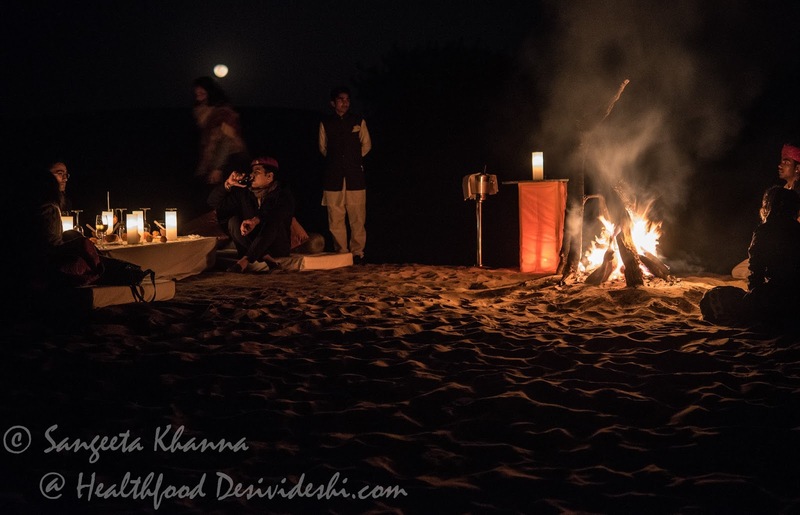 The menu they have curated for the ‘dinner on sand dunes’ is very interesting as they serve only shikar style meats and some wild berries and legumes from the region, cooked the way locals do it. We tasted some game meats, some Kumutiya (a local legume) beans and some ker sangri cooked the way locals eat. 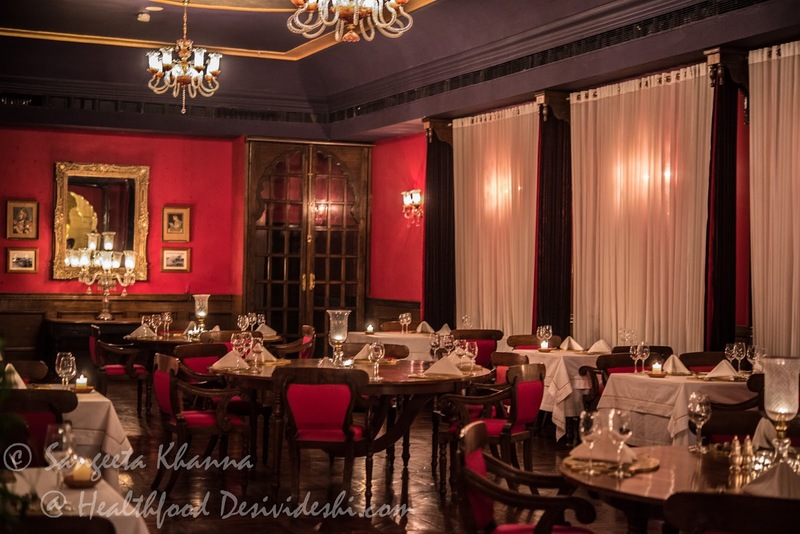 Delicious food, wonderful service, very well balanced flavors but the ambiance is such that it takes away your breath. 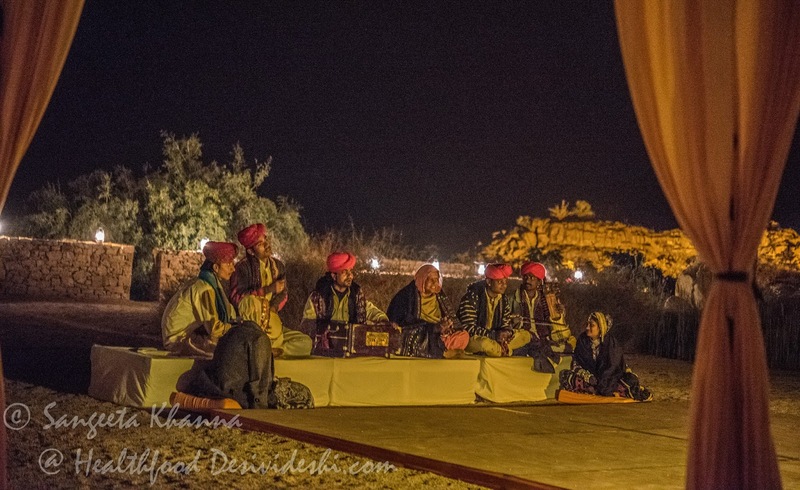 All you remember is the star lit sky and the sufi songs in rich soulful voices. Next morning we took a tour of the garden in the front, watched a wonderful sunrise, went for a walk and took a round of the kitchen garden they have on one side. It is always a pleasure to see the fresh vegetables being grown for consumption and they even grow all the flowers they use for decorations and bouquets. 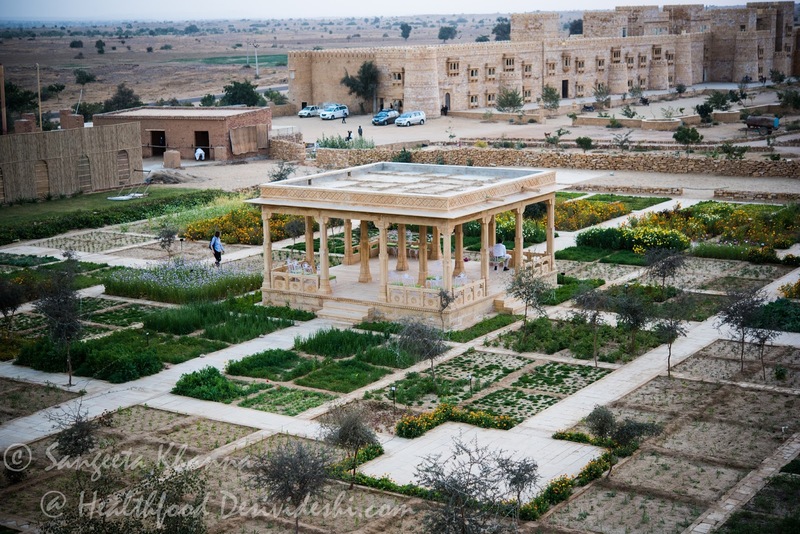 I talked to the gardeners, asked them how do they grow all this in such a harsh desert climate. The gardeners are very friendly and introduced us to everything that was growing. Later we enjoyed methi paratha made from methi leaves plucked after we ordered. Such luxury of farm to table meals, even though only the fresh produce comes from the garden it is so much better than importing exotic stuff. Although they have fewer options in the desert and they do get all the fruits and some vegetables brought from big cities. 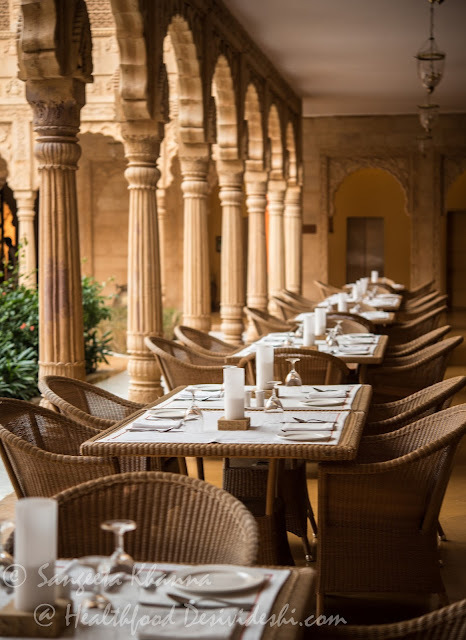 The breakfast service in the central courtyard is spectacular, their Halwai breakfast is quite popular I heard. Could not try myself as I wanted light breakfast everyday. Nosh, the all day dining restaurant offers breakfast buffet that is quite good and one gets great variety of traditional and contemporary options. We always found ourselves on these tables in the veranda outside Nosh. Their fresh mint tea had become a favorite during my stay. The second day Thar Desert trail was planned and that was an experience that I will remember for a very long time. The Thar trail also treats you with a unique luxury of a meal (lunch) by the lake with beautifully laid out mattresses under colourful canopies, picnic style food and much more. 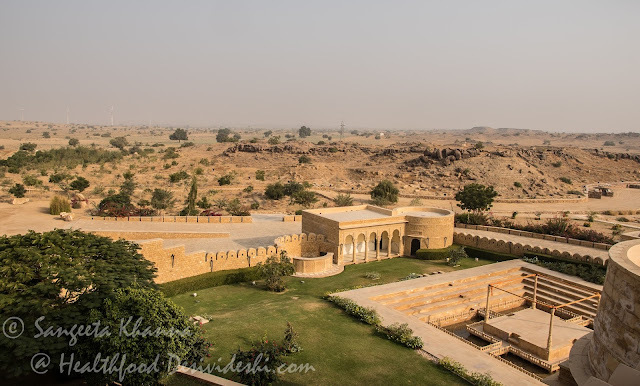 I will write about my experience of the Thar Desert trail separately in detail, I want to do justice to this very well curated trail that piqued my interest in History. 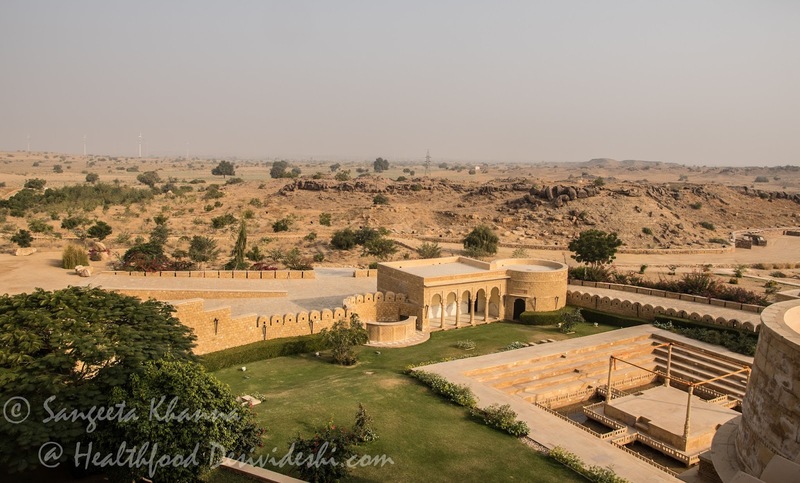 Thar trail was quite exhausting too and I had a Thermal salttherapy waiting for myself at Rait the Spa. The Thermal Salt Treatment was very soothing for my system, Arvind took the Spice Scrub Treatment advised to him by Mr. Mahesh, the Spa Manager and he also came out beaming after the spa. We went for another small walk and it was time for dinner. 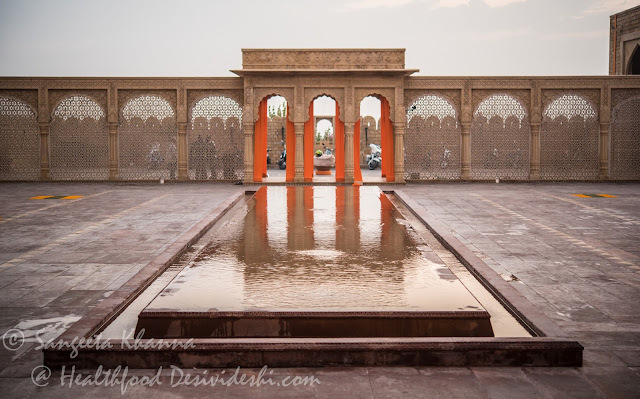 That day ended with a light meal at the Legends of Marwar, the royal themed restaurant where the food comes under a canopy. The thali at The Legends of Marwar is quite heavy with all the traditional fare, we opted for a vegetarian thali and it proved to be one of our best regional meals ever. I strongly recommend the thali meal at The Legends of Marwar. The best thing is that they serve ‘royal heritage fennel liquor’ at the end of this meal which is supposed to be a digestif. It was very good, comparable to Absinthe both in taste as well as potency. 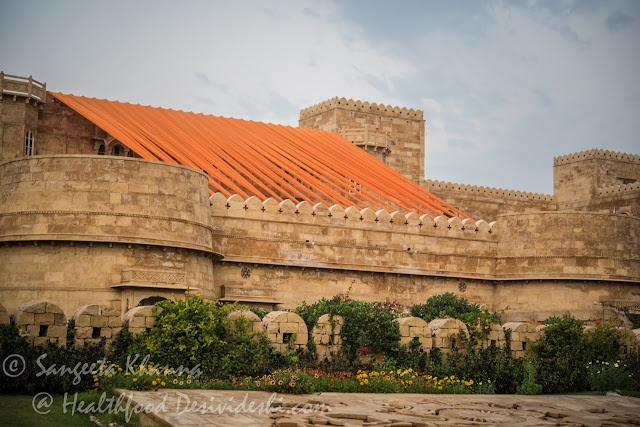 Next day we planned a tour of the city, the fort and the market. The city has so much to offer one needs a few days to discover things. 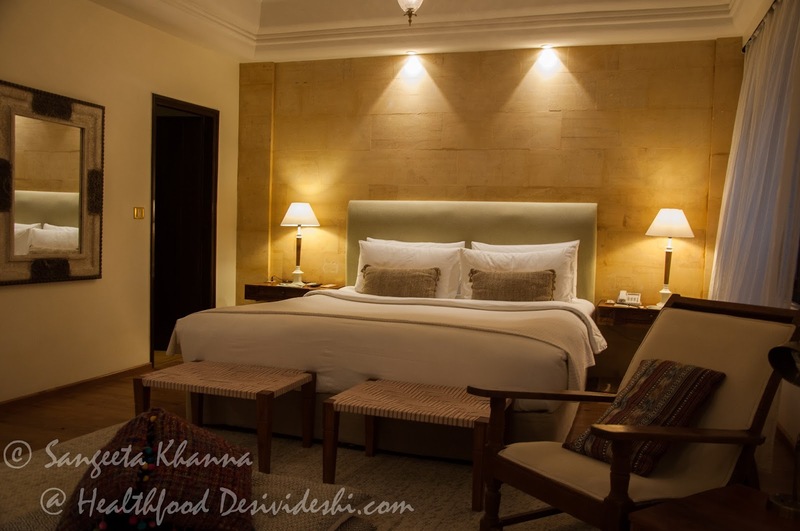 Jaisalmer is known for the yellow sandstone utensils, sculptures and building material. The old Havelis and even the Jaisalmer Fort is made of yellow sandstone, the front gates and jharokhas are always carved intricately. Suryagarh Jaisalmer has recreated the elements in it's arches and jharokhas and even the outer facade. The landscaping around the main building can be seen only when you venture out for morning walks. I recommend that strongly. The hotel is built like a fortress that stands tall in the desert landscape. This was the view from my room. 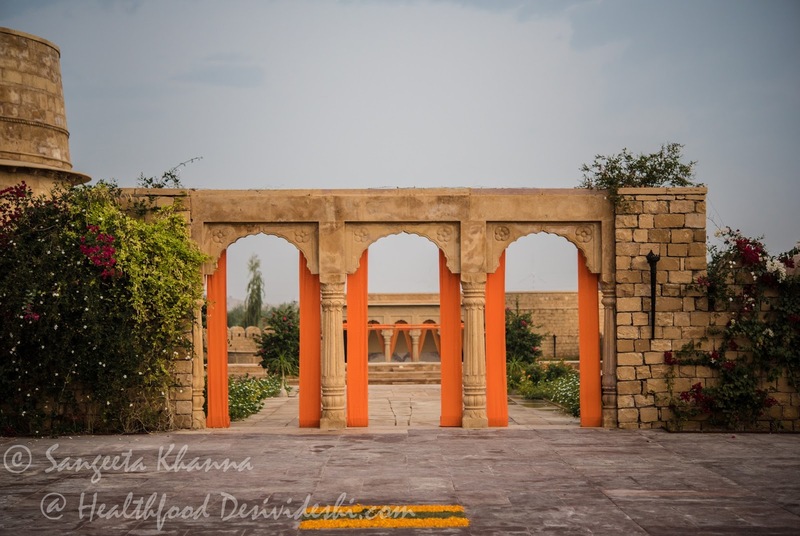 Beyond the boundary walls of Suryagarh the desert spreads till the horizon. Apart from the Khejri (Prosopis cineraria) and Rohida (Tecomella undulata) trees there are many shrub species that grow in this desert. Windmills are numerous and have become a part of the landscape. The typical splash of colours is seen when Suryagarh is decorated for the weddings. Yes it is a popular venue for destination weddings. 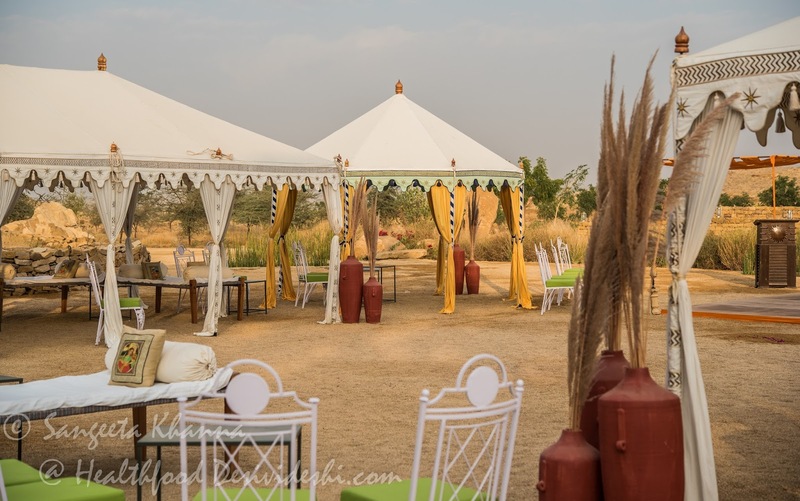 Imagine getting married in midst of the mystic desert, surrounded with royal luxury and tremendous pampering. Suryagarh Jaisalmer team pampers you a lot. We suffered withdrawal symptoms when we came back home. And it doesn't happen easily with us. 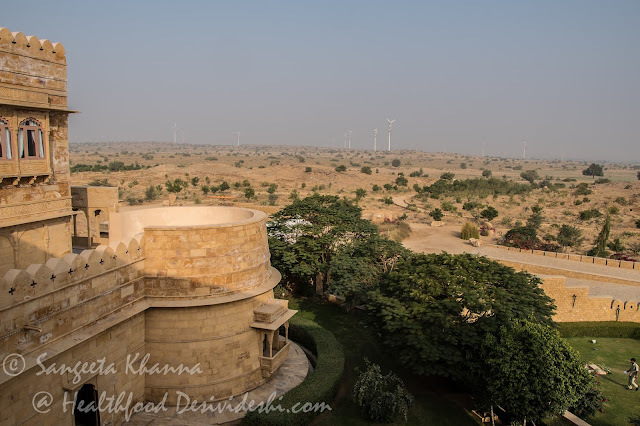 More stories from Suryagarh and Jaisalmer soon. Stay tuned.